How to connect SEO directly to revenue! Revenue is rallying cry for marketing, as it has been since the last recession and seems to be accelerating. 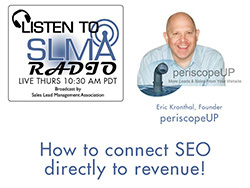 In this episode Eric Kronthal of periscopeUP discusses how SEO is not simply a long term strategy for visibility, but it can be tracked for contributions to revenue. The host this week is Jim Obermayer. Eric Kronthal is an experienced online marketer proficient in building custom solutions to meet online advertising and marketing objectives since 1996. Eric left PricewaterhouseCoopers' consulting services to become one of the early employees at Advertising.com (acquired by AOL) and he is credited with the launch of several industry leading online advertising solutions including Behavioral Targeting, Interactive Television advertising, and several self-service applications. Among the companies he worked with were Snap-on Tools, NASCAR, Match.com, USA Networks, H&R Block, PGA Tour, Southwest Airlines, TV Guide, and Comcast Cable. Eric started periscopeUP in 2009 to guide marketers toward accountable Search Engine Optimization. He and the team at periscopeUP believe success should be measured by the number of leads and sales generated, and not by search rank, clicks or visits. Customers include Trump Entertainment Resorts, Bon Secours Health System, Carnegie Mellon University, The Gettysburg Foundation, University of Pittsburgh Medical Center and CARCHEX. Eric, his wife and two children, live in Chevy Chase, MD. SEO services are just one of many offered by periscopeUP, including: Pay Per Click Search Advertising, Search Reputation Management, Display Retargeting, Web Development and Web Analytics. Regardless of the channel(s) used, periscopeUP's philosophy for increasing website conversions and leads is to optimize the marketing message for customers and prospects first and the channel or platform second. Month over month periscopeUP's analysts track, measure and report on tactics to continually improve. While based in Washington, DC, many of periscopeUP's employees work virtually from Boston, New York, and Houston.